Glistening jewels in an already sparkling part of the Mediterranean, Malta and Gozo are the crowning glory of their Archipelago. Don't let their modest size fool you, they may be small – but they are magnificently mighty! The islands' compact area makes getting around a breeze, and means you can pack as much or as little as you want into a single day. You could be sunning yourself on golden sands in the morning and exploring prehistoric temples in the afternoon. 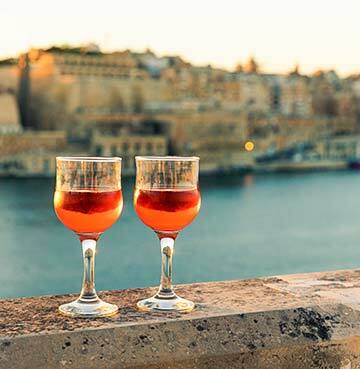 Come sun down, treat yourself to a glass of your favourite tipple while taking in the architectural elegance of the capital, Valletta. There's no such thing as a dull moment with so many things to do in Malta and Gozo. Malta and Gozo's huge historic and cultural heritage is evident in everything – it's even made its way into Maltese food! Sicilian, Spanish, French, English and other Mediterranean medleys have all influenced ingredients over the centuries, giving foodies a colourful culinary experience as they travel around the islands. Stuffat tal-fenek (rabbit stew) is considered the national dish and became hugely popular among islanders in the Middle Ages. Dubbed the 'beef of the lower classes', it made an affordable meal for families trying to keep food on the table during difficult times. To locals it symbolises social gatherings, family reunions, work gatherings and birthday lunches. Recipes have been passed from one generation to the next, and these days the dish can be enjoyed as either a starter or main. Food lovers would be missing a trick if they didn't try this traditional treat! 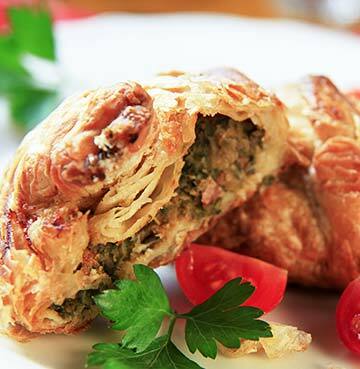 If rabbit stew is the national dish, then Pastizzi is the national snack! A long-standing love affair between the pastry packages and the Maltese may even make this their first ever 'fast food'. No trip to Malta would be complete without sampling these savoury or sweet snacks, and you can hunt them down in almost every corner of every village. Choose between ricotta, mushy peas or Nutella fillings and taste a national treasure. They're nice with a cuppa too! If a good bottle of wine wins your meal times, then Malta may just be the dark horse you've been looking for. After all, are you even holidaying in the Mediterranean if there's no wine accompaniment? The islands might not be renowned for their reds and whites like neighbouring countries, but there's still some excellent tipples packed with fantastic flavours! In fact, the locals are such fans of their handiwork that they drink the majority of what their handful of wineries produce. The most famous of which offer guided tours and tastings and depending on the season you might even be lucky enough to see the whole shebang from start to finish! If a cold beer is more your kind of caper, be sure to enjoy a refreshing bottle of the local brew. Almost impossible to find anywhere except Malta and Gozo, don't miss the chance to get your hands on a pint or two of Cisk. Of course you can find all the usual culprits and international brands in most bars too – but beer connoisseurs will want to tick this one off their list. Who doesn't love a good holiday ramble? Malta and Gozo allow walkers to explore some of the most stunning views in the Mediterranean. Wander through fields of wild flowers and grace craggy clifftops. Whether you're a keen hiker looking to hit 10km, or a fan of a slow saunter hoping to keep things under 2km – there's a lattice of nature trails spread across the islands. 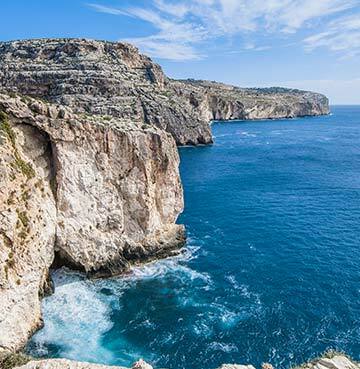 Two of the more popular routes include Gozo's west coast and Malta's Bahrija trek. Gorgeous Gozo dishes up obscure craggy caves, the dramatic coastal formations of Dwejra and startling blue sea views. Meanwhile the Rabat and Bahrija 10km hike will loop you through some of Malta's most historic sites. The dizzying Dingli Cliffs on Malta's west coast tower 253m above sea level. From here you'll enjoy breathtaking views of where sea and sky meet, as well as the tiny neighbouring island of Filfla. A first-class picnic spot, the gentle winds give just the right amount of breeze on a hot summer's day and a long leisurely stroll is ideal to take it all in. Dingli village itself is home to the beautiful Buskett Gardens and Verdala Palace, and like everywhere else on the islands – there's more than enough to do! Of course if walking isn't your kind of caper the islands are well equipped to keep visitors entertained. There's plenty of tours – ranging from quad bikes, jeep safaris, electric cars, hop-on-hop-off buses, tuk tuks and segways – that'll get you to the main attractions and historic hotspots. Some of the most popular tours involve stretching your sea legs and setting sail on the sparkling waters of the Mediterranean. 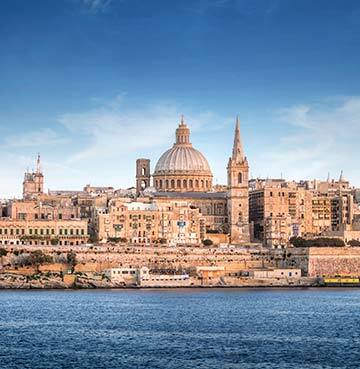 The Valletta skyline looks second to none from the comfort of a harbour cruise, not to mention the neighbouring Three Cities of Vittoriosa, Senglea and Cospicua. Weaving through their idyllic inlets are mellow glimpses into Malta's maritime history. 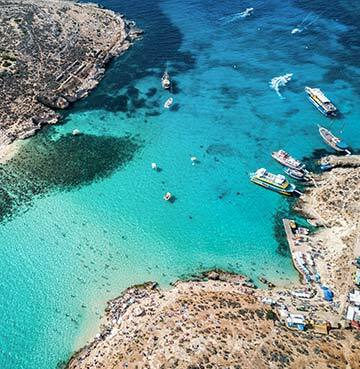 Saving the best to last, the Archipelago's worst kept secret is the bucket list beauty of Comino's Blue Lagoon. You can make your way here with the public transport and ferry system, but for luxury and ease, book yourself on to a boat tour and get chauffeured in style and comfort. When you arrive you'll be greeted by a shallow, azure waters that radiate paradise. Take it easy and spend the day sunbathing, swimming and snorkelling. You're on holiday after all! History hunters are well and truly spoilt by Malta and Gozo, with super keen historians dubbing it as 'one big open-air museum'. A bold statement, but look around and see how the layers of history come to life – even today! From the Neolithic period and Bronze Age to the Romans, the French and the British (and everything in between), they've all left their mark on magnificent Malta. Ancient ruins and Megalithic Temples are scattered across the two islands. 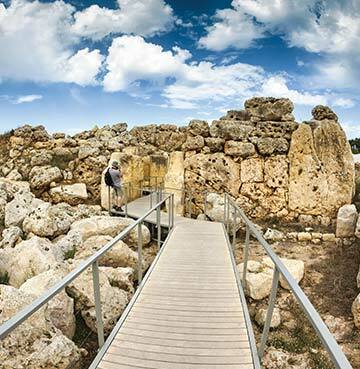 Gozo's two temples of Ggantija were built even before the famous site at Stonehenge. Their name translates to giant, and when you see the sheer size of the limestone blocks it's no wonder! Hagar Qin, Mnajdra and Tarxien Temples are all unique masterpieces considering the limited resources that would have been available at the time. Finally, undisputed proof – a bad workman really does blame his tools! The 'Silent City' of Mdina sits atop one of the highest points in Malta and treats its visitors to wide views from its proud walls. The panoramic vistas here are some of the island's finest and best appreciated from one of the perfectly perched tea houses in the bastions. Tuck into some world-class chocolate cake, sip on speciality coffee and drink it all in. Once your sweet tooth is satisfied, head out on foot and explore the pedestrianised city for yourself. Horse and cart rides are also available if you need a little longer to let your food go down. Keeping to the Archipelago's style, Mdina packs an unbelievable amount of things to do in a very small site. Before you've even passed the city walls, its magnificent gate gives you an architectural sneak peak of what's to come. Deep below the city lies St. Agatha's crypt, catacombs and a museum. The network of tombs are a must for history buffs and budding archaeologists alike. The dominating feature of St. Paul's Cathedral to the ex-Capital's skyline warrants a wander too. Mdina by night is a one-of-a-kind experience. Illuminated by ornate street lamps the winding alleyways and seemingly deserted squares become beautifully eerie. Bathed in golden light (as well as moonlight on a clear night), you'd be forgiven for thinking you'd stepped back centuries. A truly timeless and enchanting place, an after dark saunter is all part and parcel of sinking your teeth into Malta and Gozo's living history. There's really no better place to start than Malta's vivacious capital, Valletta. Charming cobblestone streets meander across the city, with new wonders unveiled around every corner. The best way to explore is on foot, taking your time to navigate the amazing alleyways and admire the quirky décor. 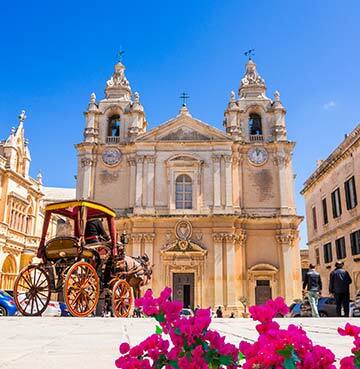 Valletta is overflowing with monuments, statues, iconic landmarks, museums and baroque churches – a must-see is the intricate and ornate St. John's Co-Cathedral. Don't forget to look down at the magnificent marble floor, it's made up of 400 tombs that house the knights of the Order of St. John. You'd need days to make any kind of dent in seeing everything Valletta offers. And this isn't something you want to rush. Take your time soaking up the sights and smells, and don't worry about getting lost. The Maltese locals are some of the friendliest you'll ever meet, and they'll be more than happy to point you in the right direction. Who knows? They might even give you the inside scoop on under-the-radar hidden gems! A little slice of city paradise can be uncovered at the Upper Barrakka Gardens. All that exploring can be tiring, so pull up a pew and pore over the unbeatable panoramic vistas. One of the best views in the house – the saluting battery, harbour and The Three Cities all lie below. Watch as cruise ships come and go and people go about their business below. As you leave, take a leisurely stroll through the grounds and admire the famous bronze statues and bust sculptures. Evenings in Valletta are exceptional. The warm rays of the setting sun pass their glow to the golden tones of the city lights, and as if by magic Valletta is all dressed up for a night on the tiles. Choose between Bohemian pavement cafés or mellow marina restaurants and prepare to tantalise those taste buds! An air of sophistication blankets the city, with live music concerts and open-air theatrics available to be enjoyed by everyone. Huge outdoor seating areas line the waterfront, and there are seldom such swoon worthy occasions to sit and contemplate the surrounding culture. This postcard-perfect fortified city is undeniably deserving of its UNESCO World Heritage Site status!